"The Savior identified Himself as Lord of the Sabbath (9). It is His day! Repeatedly, He has asked us to keep the Sabbath (10) or to hallow the Sabbath day (11). We are under covenant to do so. "How do we hallow the Sabbath day? In my much younger years, I studied the work of others who had compiled lists of things to do and things not to do on the Sabbath. It wasn't until later that I learned from the scriptures that my conduct and my attitude on the Sabbath constituted a sign between me and my Heavenly Father (12). With that understanding, I no longer needed lists of dos and don'ts. When I had to make a decision whether or not an activity was appropriate for the Sabbath, I simply asked myself, 'What sign do I want to give to God?' 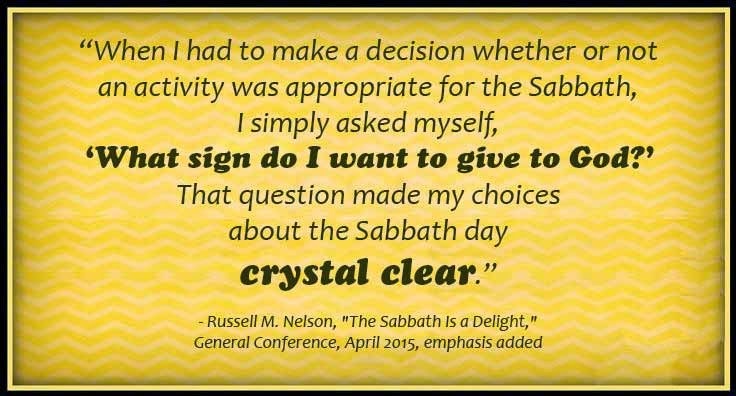 That question made my choices about the Sabbath day crystal clear." 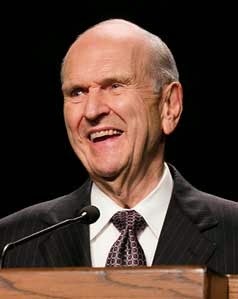 Elder Nelson was the final speaker at the recent General Conference, a change from the normal practice that the president of the Church gives concluding remarks. His talk on the Sabbath Day provided a number of concepts to ponder as we each consider the blessings and opportunities that day affords to "true believers." I especially appreciated this insight about how we look at Sabbath activities. We often make those lists of "do's and don'ts" to try to clarify. But Elder Nelson focused on these Old Testament guidelines: "Verily my sabbaths ye shall keep: for it is a sign between me and you throughout your generations; that ye may know that I am the Lord that doth sanctify you" (Exodus 31:13). To me, it's a way to be less "Pharisaical" about the actions, while considering more of the motivations and implications. And the promise of sanctification from God as a result is a wonderful one!